You are interested in new things to play with. You can get dressed and keep yourself clean with a little help. You can enjoy doing something so much that you don’t want to stop. You can get dressed and keep clean all by yourself. You can choose to do something and find what you need all by yourself. 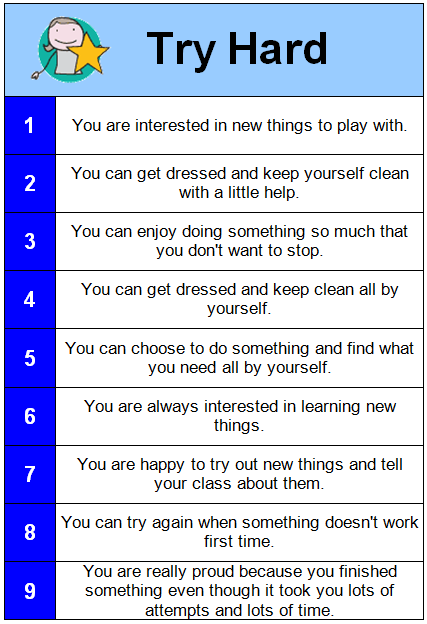 You are happy to try out new things and tell your class about them. You can try again when something doesn’t work first time. You are really proud because you finished something even though it took you lots of attempts and lots of time.